Situated in the heart of the Western Cape farmlands, the Loxtonia Farm legacy in Ceres began over 100 years ago. Since 1990, it's been owned by the Whitfield family. An expert in fruit farming, founder and head cider maker of Loxtonia Cider, Larry Whitfield exports various fruits across the world as well as to the local South African market. As business continued to boom into 2013, he soon realised there was an opportunity to use the juice from the apples on their farm to make apple cider, which in turn would fill a gap he identified in the South African market. He began research on blending apple cultivars on the farm after travelling to several cider-making regions around the world to gain insight. He and his team began working on creating a product that was not only committed to their values of sustainability, but that was also true to their roots - beginning in the soil and ending with an all-natural, premium cider. It was here that Loxtonia Cider’s key philosophy of 'Orchard to Bottle' was born, and a dream was launched in 2018 when the brand became the first cidery in Ceres. Following in the footsteps of her father’s fruit farming legacy, Ali Whitfield was appointed as the marketing manager of the cidery. Having grown up on the farm with a similar passion for the outdoors as her father, she developed an appreciation of what 'Orchard to Bottle' truly meant. “It is very special to watch the whole process take place on our very own farm – from the blossom bud, turning into an apple, to the end product being an all-natural apple cider, it truly is an exceptional process,” she says. The core philosophy of “Orchard to Bottle” drives every action at Loxtonia Cider and is what inspired the farm to adopt a zero-waste approach to farming. “Once the apples have been pressed, all of the leftover pulp goes back into the orchard as compost for the next year’s harvest,” explains Larry. The cidery runs entirely off solar energy and the soon to be launched Tasting Room was made from recycled wood used from the crate that the cider press was transported in from Germany. In May 2019, the company is taking the apple cider experience on its farmstead a step further by opening the doors to a new Tasting Room. According to the cidery, the space will complement the stainless steel tanks in which the ciders are cooled, and rustic décor will provide the perfect counterpart to the magnificent Ceres Valley backdrop of abundant apple orchards. 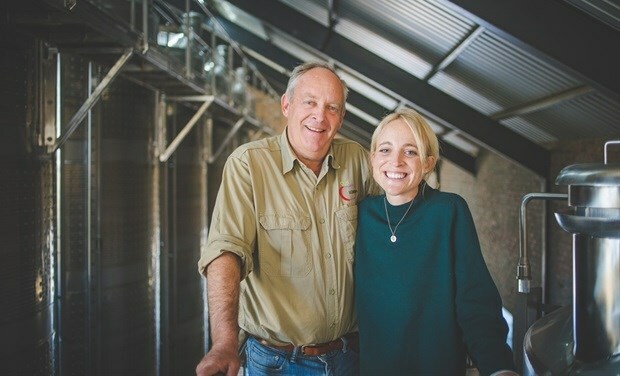 The family duo agrees that their proudest moment since starting their cider journey has been the success of working together as a father and daughter team. “To start something we have both put our whole hearts into, and seeing it come to life is so special to us,” says Ali.